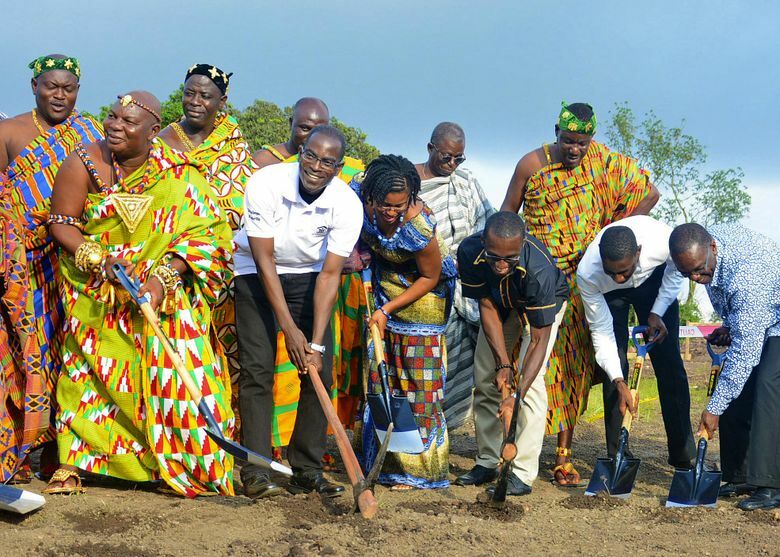 Patrick Awuah, fourth from the left, joins in at a groundbreaking at the university he founded in Ghana. Leaving a job as a Microsoft engineer, Patrick Awuah started a university in his home country of Ghana. Now he’s being recognized for that work. Patrick Awuah, who walked away from a career at Microsoft to start a university in his home country of Ghana, this week received some high-profile recognition for his work. Awuah is one of the 24 recipients of this year’s “genius grants,” $625,000 awards paid out over five years by the John D. and Catherine T. MacArthur Foundation. Awuah, 50, got the call informing him of his selection about three weeks ago. “It was a real surprise and, frankly, it took a while to sink in,” Awuah said in an email. “I feel overwhelmed with gratitude” to the foundation and those who helped build Ashesi University, the private, liberal-arts school he founded. Born in Ghana, Awuah attended Swarthmore College in Pennsylvania. As he was approaching graduation, he told a Microsoft manager in a job interview that his goals went beyond working for a technology company. He wanted to be an astronaut, he said. Failing that, he’d like to make a lot of money as an entrepreneur to be able to go back home and help people in Ghana. Awuah settled for his third choice: a job at Microsoft. He arrived in Redmond in 1989, working on Windows components that enabled computers to communicate and share resources. Awuah spent years designing Ashesi from his home in Seattle’s Green Lake neighborhood, drawing on donations of money and time from ex-Microsoft colleagues and the Ghanaian immigrants. He left Microsoft in 1997 to pursue a business degree at the University of California, Berkeley. His master’s project was a feasibility study of Ashesi. After years of planning and fundraising, Ashesi opened its doors to an inaugural class of a couple dozen students in 2002 in Accra, the Ghanaian capital. The word Ashesi means “beginning” in Akan, a Ghanaian language. The school has since moved from rented space to its own 100-acre campus in a village overlooking Accra. This year, the school launches an engineering program. Enrollment tops 500 students. The nonprofit Ashesi University Foundation, which helps support the school, is based in Seattle. Awuah said he doesn’t have specific plans for the cash award, but he’s confident he can find a way to put it to use advancing the school’s work. “The Ashesi community is buzzing with excitement,” Awuah said. Information from The Seattle Times archives was used in this report. Matt Day: 206-464-2420 or mday@seattletimes.com.